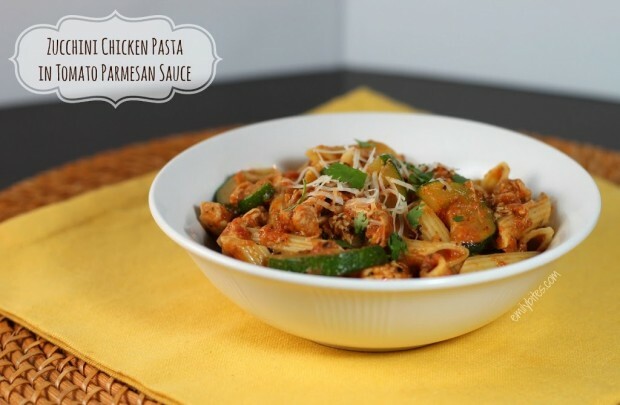 I love this Zucchini Chicken Pasta in Tomato Parmesan Sauce dish so much. I brought leftovers to work for lunch yesterday and I was looking forward to eating them all morning. I’m not going to lie, I may have taken my lunch break earlier than usual because I couldn’t wait. I’m so proud of this sauce, because I started with a can of tomatoes and I just kept adding things to it. It turned out absolutely incredible! I love Parmesan cheese. I believe I’ve mentioned this before, but when I go to Italian restaurants I generally unscrew the cap off the cheese shaker rather than sprinkling for 20 minutes to reach my desired amount of cheese. I just want ALL THE CHEESE. The sauce in this dish combines the smoky taste of fire-roasted tomatoes with the sharp, savory Parmesan flavor I adore and the results are mouth-watering. Zucchini works so well in pasta dishes and since it’s a perfect complement for Parmesan, I knew from the start it would be great in this recipe. Besides adding a Summery feel and delicious flavor to the dish, the zucchini also adds volume and along with the pasta and chicken contributes to making the dish hearty and satisfying. The serving size of 1 ½ cups is very filling and a great use of 6 Weight Watchers SmartPoints or 324 calories. 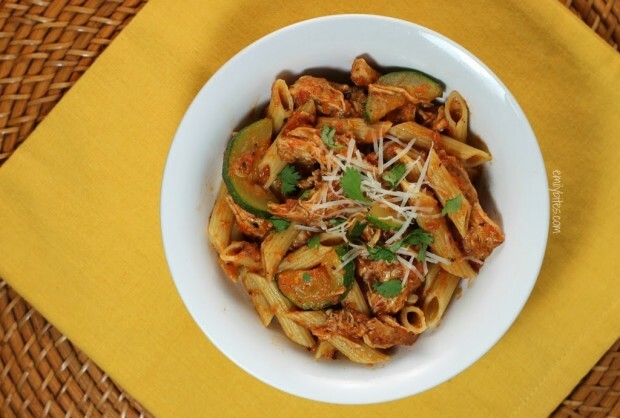 Though it may look like there are a lot of ingredients, this Zucchini Chicken Pasta in Tomato Parmesan Sauce comes together quickly and is perfect for a weeknight meal. Serve it to family or guests or keep it to yourself – it’s sure to be a hit! While the water is boiling for step one, combine the crushed fire-roasted tomatoes, tomato sauce, sugar, salt, Italian Seasoning, dried basil, lemon juice and crushed red pepper I a mixing bowl and stir until well combined. Set aside. Pour the tablespoon of oil into a large skillet or saute pan and bring it over medium-high heat. Add the chicken breasts and sear on each side for 3-4 minutes or until browned. Add the minced garlic to the pan and cook an additional minute until garlic is browned and fragrant. Reduce the heat to a medium-low simmer and pour the tomato sauce mixture over the chicken breasts. Simmer uncovered for about 15 minutes until chicken is cooked through and easy to shred. When the chicken has about 6-7 minutes left to simmer, heat the reserved teaspoon of oil in a separate skillet over medium heat. Add the zucchini and sprinkle in salt and pepper to taste. Cook the zucchini for 5-6 minutes or until it softens and starts to brown. Set aside. When the chicken is done simmering, shred the breasts using two forks and stir them back into the sauce. Remove from heat and add the half and half and Parmesan cheese (you may want to reserve a bit of the Parmesan for garnish). Stir in thoroughly until well combined. Add the reserved penne and zucchini to the chicken and stir until coated and combined. Serve garnished with reserved Parmesan and chopped parsley is desired. Oops! I always just pull up an older recipe and modify it to keep the same format. The nutrition info is correct I just forgot to change that wording. Thanks for letting me know! This looks awesome! Going to leave out the chicken and maybe add mushrooms to make it vegetarian :). Thanks for all the awesome recipes! I love sauces like this so great for all the summer zucchini! Made this last night and ate leftovers for lunch today! Thanks for all your awesome recipes Emily! I loved this one and think I will add mushrooms next time too! I made this last night! It’s delicious, though a bit dish-intensive. Next time, I might sauté the zucchini first and set it aside, then cook the chicken in the same pan. It warms up quickly enough in the sauce when you add it back in anyway. My fiancé loved this as much as I did! We made this a few nights ago and LOVED it! The only thing that didn’t come out well was that the chicken wasn’t very tender… not sure if I cooked it on too high heat or what. But we’re definitely going to make this again and try experimenting with cooking the chicken ahead of time, shredding it, and then adding it to simmer with the pasta. Thanks for another great recipe! This was FANTASTIC! Three of us ate it, and we all loved it. My husband said it was one of his favorite meals, and that it was better than restaurant quality — and he isn’t even on WW! Thank you! I made this last night….thought it was REALLY great. The flavors melded really well, and the sauce had a bit of a kick (I didnt have red pepper flakes, but added in a few chili flakes). I agree with other posters that this would be good with some other vegetables added in as well (i.e. mushrooms or, my husbanded suggested red peppers and/or sundried tomatoes too)– the chicken didn’t shred too easily, but that didnt bother me much. I’m going to make this tonight with shrimp instead of chicken:). I can’t wait to eat it! Very filling and tasted fantastic. It does take awhile to make but well worth it. Just made this the other night, and it was awesome! I chose to use a lb of leftover chicken chunks I had in the freezer and it was perfect. I’m always looking for ways to use up the chicken pieces leftover from cutting breasts into cutlets. Hi Doris I only have the points calculated for my recipes the way I recommend making them so if you want to make changes you will have to run the ingredients you choose to use through the recipe Builder on the Weight Watchers website. Enjoy!